I just came back from a week in Hamburg and was pleasantly surprised to find that Stuttgart has turned into a Winter Wonderland! Everything is completely white and it is absolutely magical! Matt was working when I came home, but Poppy awaited my arrival and gave me the highest dose of slobbery kisses she could give me! Dog owners probably know what I'm talking about: this unbelievable amount of happiness when you come home to them! It was lovely spending some time in Hamburg again even though I had very little time to enjoy the city again. I went there to do a workshop for the cruise ship company I used to work for. They develop new theatre shows quite often and these shows need to be 'tried out'. They then hire an ensemble of singers with whom they work for the week to see if the show works the way they intended it to work, or if things need changing. It's always great fun being part of this creative process and to work with my old colleagues and directors as well! I can't tell anything about the shows themselves since it's kept very secret until they're released to the public, but I can tell you that this time I had quite a lot of spare time during rehearsals. Spare time is one of my favourite things in the world because cause that means I get to craft! The great thing about knitting and crocheting, is that (most of the time) you can do it anywhere! Just before I left for Hamburg I had this weird craving to make socks again. I've made a couple pairs of socks last year, and than lost interest again. My hands started to itch for sock making again though, and I bought some yarn and took it with me to Hamburg! I guess it was meant to be, because I had just enough spare time to finish both socks within the week I was there. I made my last stitches just before getting onto my flight back home. I can't show the socks in their full glory yet as they are blocking as I'm writing this. I always see people post photos of their socks on perfect sock blocking 'tools' (I'm really not sure what they are called) but since we don't have any of those, I had to improvise. I just drew around my sock on some cardboard, cut out the sock shape and covered it in sticky tape. Not really picture worthy but it does the trick! They're almost dry so I'll post a picture soon! I've also been working on my own little sock pattern! I had this idea in my head that I wanted some vertical "Zig Zaggy Lacy Sripes" on my socks and I think I'm quite happy with how it's turning out! It always takes quite a while before a sock is finished, so I better get cracking! And could anyone maybe create a copy machine for socks? It would be so great to make one sock, and than just copy it so that there's two! If any of you have some tips to make sock knitting go faster or make it more fun, let me know! Also, I'd love to hear about your favourite go-to sock patterns! Is there a pattern that always does the trick for you? 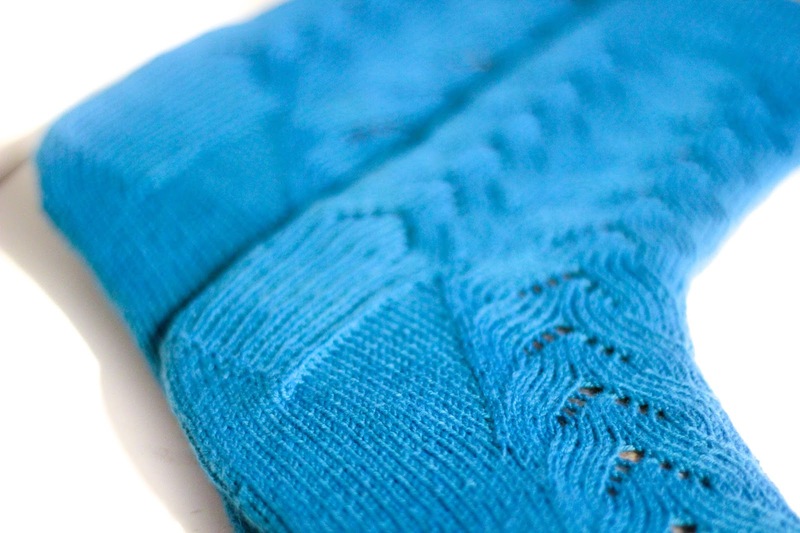 Or do you keep changing patterns every time you knit a new pair? Beautiful socks! I aspire to socks like that! I have just finished my very first pair - they are just a very basic pattern and there are a few mistakes, but I have already cast on my second pair...practice makes perfect. I have never got the hang of double pointed needles, but I have discovered teeny, tiny circulars (just 23 or 30cm) and they are perfect for whizzing around and around. I think I may become addicted! Hi there! Love the yarn and the pattern! 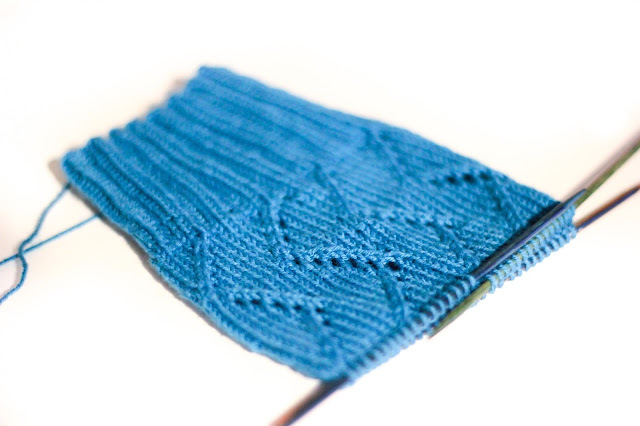 Since you know how to knit on circulars with the magic loop, you can try knitting two socks at the same time. I've heard a lot of people being enthousiastic about it. I haven't tried it myself. I prefer five double pointed needles. But yeah, that second sock can be a pain in.... ;-) Btw, if you use two different colours of yarn, try the seed stich. If you want, I can send you a pic of socks that I've knitting using that stich and two different colours of yarn. Just let me know! Keep up the good crafting! I have only just started knitting socks and not attempted a patterned pair yet but I think you have inspired me! I use a long circular needle and knit them from the toe up so really easy peasy. Hi, I agree with Danielle about the Magic Loop. I personally have not used them but my son is learning on it and says it is so easy. You can knit two at once! Almost like a copy machine. Love your new look by the way. Glad you are back. As a 'sock knitting addict' (my husband and son refuse to wear any socks other than ones I've made!) I used to suffer from 2nd sock syndrome. I tried the magic loop method of knitting 2 socks at once, but after getting in a terrible mess when I became engrossed in a film on t.v and wasn't concentrating, never again!I then started knitting the first sock, then starting a 2nd pair in a totally different colour and pattern, then going back to the 1st pair, so it felt as if I was starting again on a new pair well it works for me! Socks are on my 'must-try' this year list. These are super, they look perfect Dennis.